Made by Brown, Amelia in Bowning, New South Wales, Australia, 1857. This quilt was designed and made by Amelia Brown (1817-1905) of Bowning, New South Wales, at about the time of her arrival in Australia in 1857. 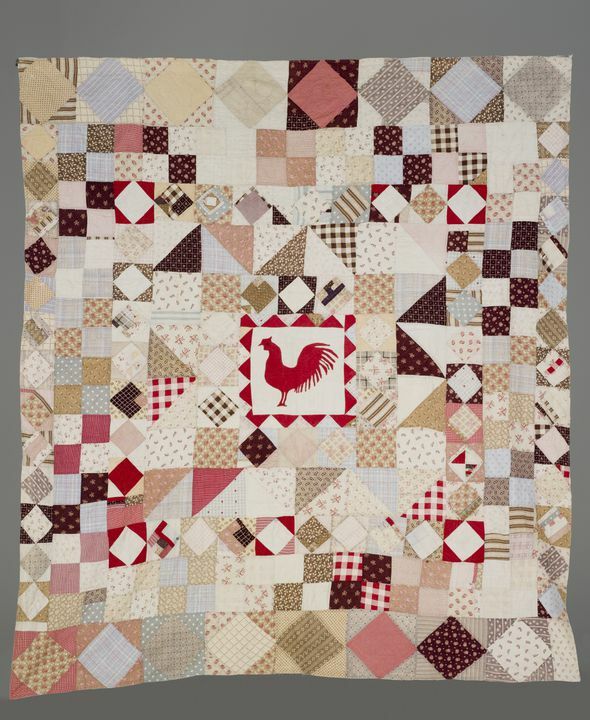 Pieced quilts such as this are important reminders of women’s domestic lives in colonial New South Wales. Since many women had to make all their families’ bedding, they did not often go to such lengths to produce decorative bed coverings. Few finished quilts survive from this period. Rectangular pieced quilt with rows of pieced and appliqued squares radiating out from a central medallion. The patchwork pieces are cut from plain and patterned cottons, including small floral prints, checks and stripes. The central motif of a cockerel is appliqued in red on a white square, the square surrounded by red appliqued triangles. The back of the quilt is made from pieced white and cream fabric. The quilt is hand pieced and hand quilted in a continuous design of circles, hearts and petals. The quilt was made by Amelia Brown (1817-1905) who arrived in Australia from Exeter, England, in 1857 with her husband and seven children. They came out during the height of the goldrushes, and family stories suggest the quilt may have been made on the voyage out, one of the few times Amelia would have had sufficient leisure for such an undertaking. Little is known about the exact time and place the quilt was made. Family stories suggest it may have been made during Amelia Brown's voyage to Australia in 1857. It was common practice for women to take sewing with them for the voyage. Indeed convict women had been issued patchwork pieces by charitable organisations to give them something to do on the voyage and something to sell once they arrived. Certainly, with seven children and a husband to care for, this was one of the few times Amelia Brown had sufficient leisure to cut out and piece a quilt. The similarity in fabric, design and construction to the other quilt known to have been made by Amelia suggests that both were cut out and made up at around the same time. After trying their luck on the goldfields, the family settled on a property called Oakvale outside Bowning. After the death of her husband Amelia stayed on at the farm living with her youngest son, John Brown. After his death she moved into Binalong and lived with another son, William Brown, the father of vendor Una Braby. The quilt remained in the family all this time, generally stored in the linen closet. It was aquired by the Museum in 2004.